6 Things That Helped Me Lose Over 100 Lbs And Keep It Off Over 4 Years! You are here: Home / Weight Loss / 6 Things That Helped Me Lose Over 100 Lbs And Keep It Off Over 4 Years! I want to share 6 things that helped me lose over 100 lbs and keep it off over 4 years. I know I have mentioned my weight loss before, but, I wanted to revisit it and offer these suggestions that worked for me to lose my weight and get healthier. I know many people right now are struggling with their weight and with leading a more healthy lifestyle and cleaning up their diet. 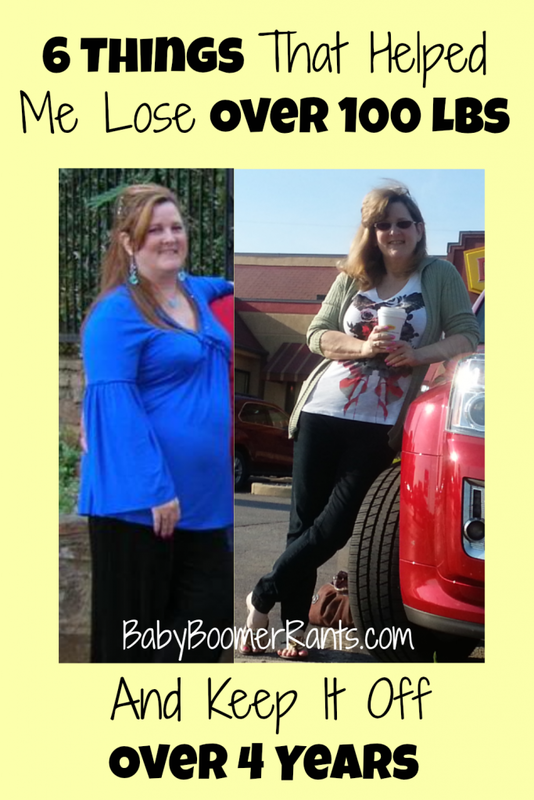 Hopefully my story helps motivate someone to take their health more seriously. The beginning of the new year is always filled with ways to improve on our lives. So we always look at how we can save more, eat better, lose weight, exercise, and so forth. We often start off strong but then life gets in the way, we slowly but surely lose our drive to make those new found goals. A few years back I was over 100 lbs overweight but thought I was healthy as a horse. I ate what I wanted which included many carbs for me, sweets were not my problem, carbs were. I could eat a potato mashed, fried, run over with a car, I didn’t care, I just wanted them! I was sent to get my pre-surgery blood work done, and that’s when it all came crashing down. All of the carbs, extra weight, and no exercise came to a head when a few days later the phone rang and the nurse told me I couldn’t have the surgery because I had Type II Diabetes. I was in shock. You see I had lost a husband to this disease years before and I know how devastating the disease can be and what it can do to your body. I went back to the Dr. to see if they made a mistake. Here’s a dramatic recreation of the conversation. My determination was far more than just a “New Year’s Resolution” type determination. This was a “Oh my goodness, I have let it go too far!” determination. The first thing I did was read everything I could get my hands on and began to use all of that knowledge to try and formulate a plan that worked for me. I feel that the most important thing I did was find something that worked for me. Something I could essentially do for the rest of my life without feeling like I was losing out or not “normal”. I wanted to be able to hang out with friends and family and not feel like I “couldn’t” have something or couldn’t enjoy myself because of restrictions. With dietary changes and Diabetic medicine the Dr. gave me, I was able to get my blood sugar under enough control that I was able to have the surgery. After the surgery I had to be in bed for quite sometime, AND lose weight. I knew the weight loss was key to allowing my body to function the way it was meant to in the first place. I knew it had to be a lifestyle change to get rid of the Diabetes and weight and keep them both at bay. I also knew if I chose to lose it with exercise I wouldn’t keep it up for the rest of my life, so it would end up coming back. That meant an exercise routine was out. I know I NEED to exercise I just don’t, and I know I wouldn’t do it with any regularity, so again that was out as part of the solution for me. Portion sizes were a big thing for me, I chose to eat correct portion sizes. So, I bought a food scale and weighed the protein for my meals and made sure I didn’t overeat or snack between meals. One thing I read was that when your brain tells you you’re hungry, be sure to check with your stomach and make sure your brain is telling you the truth. lol When you pass a bakery you may have just filled up on lunch earlier, but the smell from the bakery makes you say “Ohhhh… I am sooo hungry…” When in fact you are quite satisfied. You smelled the fresh bread and your brain told your stomach you were hungry, but if you stop and think and listen to your stomach you would find that while you could probably eat more, were you actually hungry? No. belly fat is called Omentum and it squeezes your kidneys and that causes high blood pressure. It poisons your liver and causes high cholesterol, it also blocks insulin which causes Diabetes. All of that is caused by belly fat! watch a skinny person eat. They don’t eat it if it doesn’t look good – what?! lol That one helped me a ton! Side note: one day after my surgery my sons got some fast food and came over and sat with me and ate and talked. I watched one of them (they are both thin, but, one is really thin) like a hawk, and then something incredible happened! One of my sons bit a piece off of a french fry and threw the other half in the trash! I stopped him mid-sentence and demanded to know why he would throw away a perfectly good fry! He said because the other side was brown… WHAT?!! I saw it, it was brown, but it wasn’t molded or dirty or stepped on (I’m not sure, in the past, that any of those situations would have kept me from eating it!). I was shocked! I have watched him closely now when he ate and basically if it is not pretty, he won’t eat it! If it doesn’t taste good he won’t eat it! ANDDD… if he isn’t hungry, he won’t eat it! What?! all of this was foreign to me! I mean I HAD to clean my plate! Bad, good, or ugly, the job had to get finished and I was your girl! Using what I had learned in 6 months with a good portion of that time spent in bed recovering from my surgery and unable to exercise, I lost 60 lbs and was able to stop taking medicine for the Diabetes. It’s been 5 years and I have maintained my weight loss of over 100 lbs and I don’t have Diabetes anymore (my Dr.’s words), and I don’t feel deprived of anything! Whatever your health goals are make realistic changes to your lifestyle, ones you can maintain without feeling deprived. You’’ll be less likely to give it up! Would love to hear some of your secrets.